Design and Trade Professionals receive exclusive pricing. Easy Returns. Click to read our Return Policy. Antique Russian Dagestan Square Rug 02’10” x 02’10” From Esmaili Rugs Collection. Modest yet full of character, this antique Russian Dagestan rug displays an allover repetitive pattern of symbolic boteh motifs. The boteh resembles sprouting seed and is known as the "Seed of Life." It represents potential for growth and regeneration. Enhanced by its time softened colors and gentle waves of abrash, this antique Dagestan features an alluring patina. The refined color palette and well-balanced composition contribute to the overall magnificence of this antique rug, while the delicate floral border encloses this captivating work of art. The attention to detail and fascinating paisley motifs allow for continual discovery. 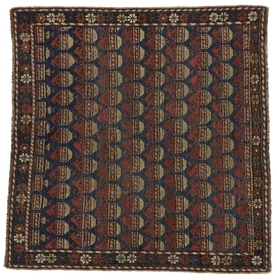 Rendered in shades rustic red, blue, brown and beige, this antique Russian rug is well-suited for modern style interiors. © 2016 Esmaili Rugs and Antiques, Inc. All Rights Reserved.